That’s right, you recognized the font, didn’t you? Yes, Justin Kamerer (Angryblue) is the author, and he created way too much dark stuff for metal bands to make their music even creepier. And he is not gonna stop, this is just the beginning. As he likes to call himself, he is an “art whore” and he has all the reasons in the world to be proud of himself, because his art is to be found almost everywhere, from posters, album art, t-shirts, hoodies, skins for i-phones, tattoos and the list continues. God knows on what may have people printed his works on. Here are just some of the bands he has created art for: Metallica, GWAR, The Killers, Nirvana, Nine Inch Nails, Marilyn Manson, My Chemical Romance, Genesis, Paul McCartney and even Ashlee Simpson. Although he started in the digital are as a web designer, doing websites, he soon realized that he was meant for art, so he worked with a company called Bravado Merchandising, where he had the opportunity to experience a lot in the artistic field, and he created also a strong portfolio. He became the renowned illustrator and graphic designer that he is today, and he is “still growing”, as he likes to say. His friend and art partner, Jeral Tidwell (Humantree) helped him a lot in his decision to quit his job and pursue his dream. He is one of the 3 members of Monument Studio (monumentstudio.com), the place where he attempts to take over the world through art. Also, alongside Tidewell, he has been of a sustainable support for his native place, Louisville, and he is an important rock art source for Hot Topic merchandise. He has done tons of sketches, and he likes to draw and paint with India ink, and then take it to the computer to add colors and textures. He used to do that with Adobe Illustrator, but then realized that with Photoshop he could experience more with textures and raw results, and the image was not so big as in Illustrator. After many, many requests from Angryblue’s and also Humantree’s fans, the first INK ALCHEMY BOOK saw the light of the day, amazing with 40 pages with well over 50 pieces of art! 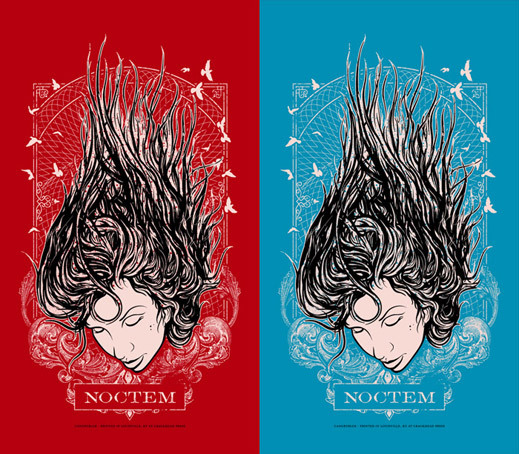 Hand screen printed covers, signed by both artists and numbered. There are only 400 of these printed. INK ALCHEMY – VOL II contains over 40 pages of the latest and sickest illustrations from both Humantree and Justin Kamerer (Angryblue). The books have a 3 color screen printed cover with aged parchment pages. Limited edition of only 650 books. Signed by both of them. INK ALCHEMY – VOL III – after an year from the release of Ink Alchemy Vol 2. This new release features over 40 pages of illustrations from both artists, all on aged parchment paper, with a 2 color screen-printed cover. The books are signed and numbered in an edition of 800. The first 100 orders will also get mini art prints from both artists. Angryblue ‘Popesicle’ deck! Only 40 available. – here. Free Tattoo Designs In Vector Format ! What’s Up! Just wanted to say you developed a great little website and I want you are aware how welcoming it looks. Will come back frequently.